"mafi parquet floors do not need to be re-oiled in private homes, but rather maintained with warm water and wood floor soap." Many manufacturers recommend oiled wood floors be periodically re-oiled. 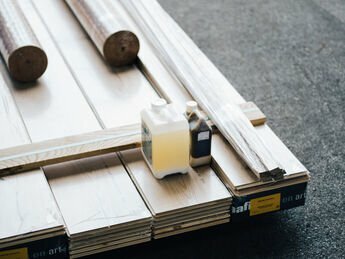 As this regular care often means the oil in the wood gets washed out over time, it is important that the floor is still protected. Re-oiling is, however, a complex procedure and requires the associated drying time and rearranging of the furniture. mafi natural wood floors in private homes are thus cared for with the appropriate wood floor soap. The high fat content of the soap works every time like a light re-oiling. Thus, the floor is cleaned and maintained in a single operation. In addition to the time savings in everyday life, the floor does then not need to be re-oiled. Even if a refresher of the surface is desired, this can be done with a care balm, which is dry after 4 hours and is easily applied with a cotton cleaning mop. How do I properly clean parquet? The cleaning is directly related to the surface. If a wood floor is sealed, too much humidity becomes a problem. If the humidity gets under the seal, the wood absorbs the moisture and tries to expand. In the worst case, the plank deforms or the water goes black and leaves stains. Open-pored surfaces, such as in mafi natural wood floors, can be wiped with much more water. Here, it is only important that warm water is used and really only wood floor soap is added. Otherwise, it would dry out the wood. Unlike with sealed floors, dirt and stains are easily washed out. Another advantage of this surface is that repairs can be carried out only on the affected area without having to re-work the entire surface.